There is 2.38 mcg of Vitamin K in 1.0 steak (yield from 181 g raw meat) of beef tenderloin steak (separable lean and fat, trimmed to 1/8" fat, choice, cooked, broiled). If the only thing you ate today were beef tenderloin steak (separable lean and fat, trimmed to 1/8" fat, choice, cooked, broiled). You would have to eat 37.82 steak (yield from 181 g raw meat)s in order to get your 100% recommended daily value of 90mcg of Vitamin K.
Similarly, in order to get 50% (45mcg) of your daily recommended value of Vitamin K. You would have to eat 18.91 steak (yield from 181 g raw meat)s of beef tenderloin steak (separable lean and fat, trimmed to 1/8" fat, choice, cooked, broiled). Additionally, you would have to eat 9.45 steak (yield from 181 g raw meat)s of beef tenderloin steak (separable lean and fat, trimmed to 1/8" fat, choice, cooked, broiled) to get 25% (22.5mcg) of your recommended daily Vitamin K.
How does the Vitamin K content in beef tenderloin steak (separable lean and fat, trimmed to 1/8" fat, choice, cooked, broiled) compare with other foods? Here are some examples of foods that compare with beef tenderloin steak (separable lean and fat, trimmed to 1/8" fat, choice, cooked, broiled). Fig.1. stu_spivack, "tenderloin," Published December 6, 2006. https://www.flickr.com/photos/stuart_spivack/315485185/. Accessed February 3, 2016. 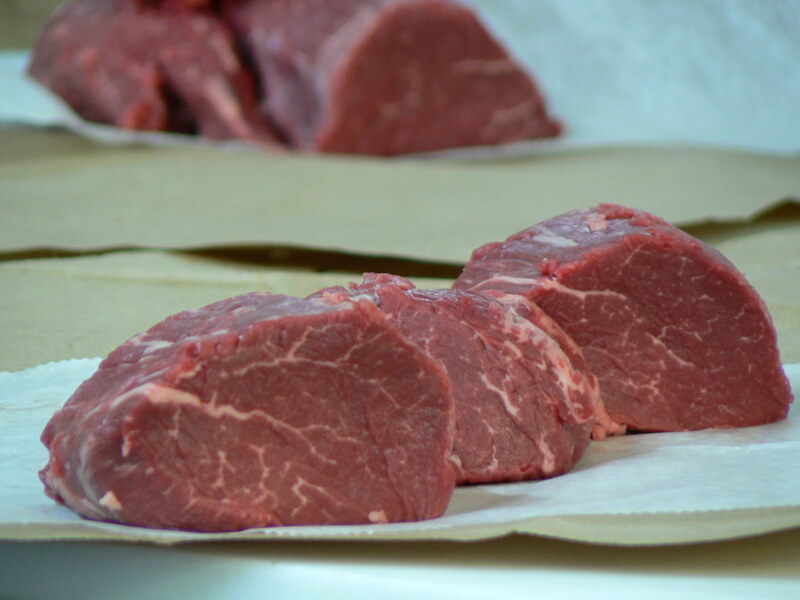 "Beef, tenderloin, steak, separable lean and fat, trimmed to 1/8" fat, choice, cooked, broiled", NDB 13921, U.S. Department of Agriculture, Agricultural Research Service. Nutrient Data Laboratory. USDA National Nutrient Database for Standard Reference. Nutrient Data Laboratory Home Page, http://www.ars.usda.gov/ba/bhnrc/ndl. Accessed October, 2014.